Interior designer Chad James, principle of the Chad James Group, has an eye for detail. The designer, whose firm focuses on architecture and interior design, is known for his meticulous attention to detail in a space, whether it be a residential interior or an iconic restaurant. And it's the details that will truly take your breath away in this Chicago penthouse. Located near Lake Michigan, with views of the city skyline, the design of this family apartment was inspired by Chicago's unique blend of skyscrapers and natural beauty. It was the "golden hour" that inspired James for the design of this space. That moment when the sun sets in Chicago, and a palette of gold, steel gray and blue seems to emanate from the city's surrounding buildings and the lake. 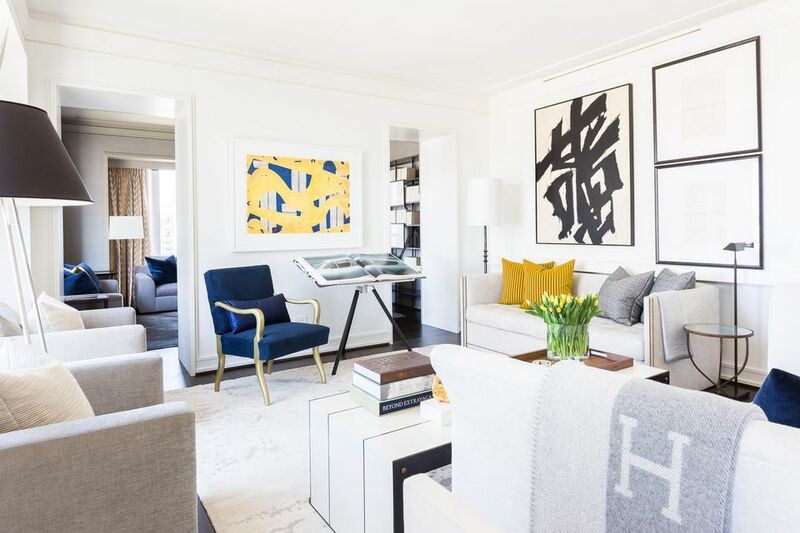 That palette makes an appearance throughout this interior, with gold and blue textiles, art and a mix of steely gray accessories. This penthouse apartment exudes cool. Art is used to marry the unique color palette, and pieces like a book of photographs featuring our modern day James Bond add a touch of effortless chic to the interior. It seems like every room in this chic home comes with a view of the city. In the dining room, the view and the interior become one. Cream dining chairs and an upholstered banquette are a reflection of the neutrals that make up much of the cityscape. A cozy dining nook that seats six is flanked by unique pieces of art. Dominated by shades of blue, the painting over the dining table is a nod to the beauty of the Great Lake that borders the city. The kitchen is an ode to glamour with a mix of stainless steel appliances and matte black lighting that we can't get enough of in this thoroughly modern space. Here, the masculine and feminine mix can also be spotted. Hard edges have literally been framed in the home's cabinetry, while art and soft metallics are used to soften the space. In the family room pattern dominates. Rich layers begin with the chevron drapery at each window. While a mix of pillows featuring whimsical florals and oversized stripes complete the pattern on pattern display. In the family room, rows of color-coordinated books in off-white add a relaxing note. They are the perfect backdrop for framed architectural works and plans that create a unique artistic display. The master bedroom in this chic penthouse exudes luxury. The feel is that of a hotel suite, except the home's occupants are lucky enough to never have to check out. And the view from the bedroom window is another treat, making the skyline feel like it's just within reach. In the bedroom, a layer of subtle neutrals—beige walls, cream wallpaper, linen and gray seating—work together to create a calm environment. The subtle shades are warmed by a gold, metallic chandelier that hangs above the seating area in the master. Textures also enhance the neutral color palette in the master bedroom, with a trio of velvet pillows on the bed in front of a woven wallpaper that adds a natural feel to the space. The nursery is where color really pops in this contemporary home. A mix of candy-hued primary colors is reflected in the art, textiles, and rug in this stylish baby's room. Just like in each room in this home, James chose textiles that bring together the color palette of the space, like this pillow that is full of rich shades. The guest bedroom is another space that no one will ever want to check out of. In crisp shades of cream and gray, the neutral palette is used to create a relaxing environment for guests. A sofa in the guest bedroom is made extra cozy with a mix of cushions sporting stripes and graphic designs. The neutral mix is so soft and calming in this guest bedroom. Again, texture has been used to add to the feel with velvet pillows and an upholstered headboard. A final note in this bedroom—a metallic side table is topped with art and a ceramic lamp with clean lines, for a warm, contemporary feel. In the bathroom, a mix of materials, from marble to brass, is used to create a space that is literally breathtaking. We can imagine making as many excuses as possible to buy some extra time in this oversized soaking tub. Even the vanity sports a posh mix of materials, with silky gray seating as the final punctuation in this sophisticated master bath.